Ever since upgrading to a real server, I’ve wanted a place to actually have it mounted. Unfortunately server racks aren’t cheap and I also needed something smaller than your typical rack that goes into a server closet. I found the Xrack Pro which looks like a very nice solution and also reduces the noise of server fans. The only problem is that they run right around $500 which is more than I paid for the server itself. Even used and on the secondary market they still sell for $300+. 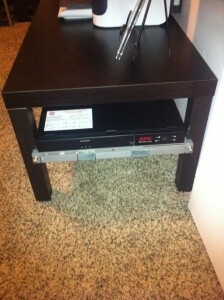 I started looking into some DIY type options and found some pretty good ones, but the best/easiest I found was the LackRack. The Ikea line of Lack tables happen to be the perfect width for rack mount server equipment. The basic table runs around $15 which will hold systems with less depth. 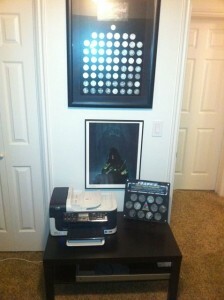 They also have the Enterprise edition which is the Lack coffee table and runs $20. The latter version has a middle shelf and has the depth for deeper servers like my Xserve. We went to Ikea this weekend and I decided to try one out and I’m very happy with the results. It doesn’t cut on the noise which would have been nice, but as far as making a server look good in a home it does the job. 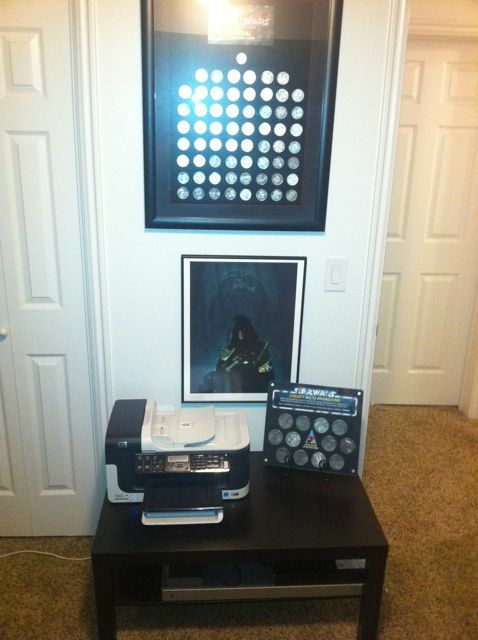 Here’s it is setup in my office/collection room. This entry was posted in Apple, Server by Shawn. Bookmark the permalink.